I've had a number of Bluetooth speakers in the past, some expensive (Bose Soundlink II), some cheap (Jambox), and the SoundCore 2 is the one I use the most. First of all, the Soundlink II using DC power, which is a hassle nowadays. Moreover, the price I paid does not justify the product quality. The Jambox sounds horrible and isn't easy to sync. It's amazing that Anker packed such a punch into such a small speaker at a VERY fair price point. This might just be me, but I very much appreciate the thought that goes into Anker's products. They also have a premium feel and are easy to open. Connecting the device was extremely easy. Anker includes an owners manual, but I didn't even bother to look at it. Turn the speaker, hit the Bluetooth button, search for the speaker on my device and connect. It took less than 60 seconds. The battery is ridiculously good. 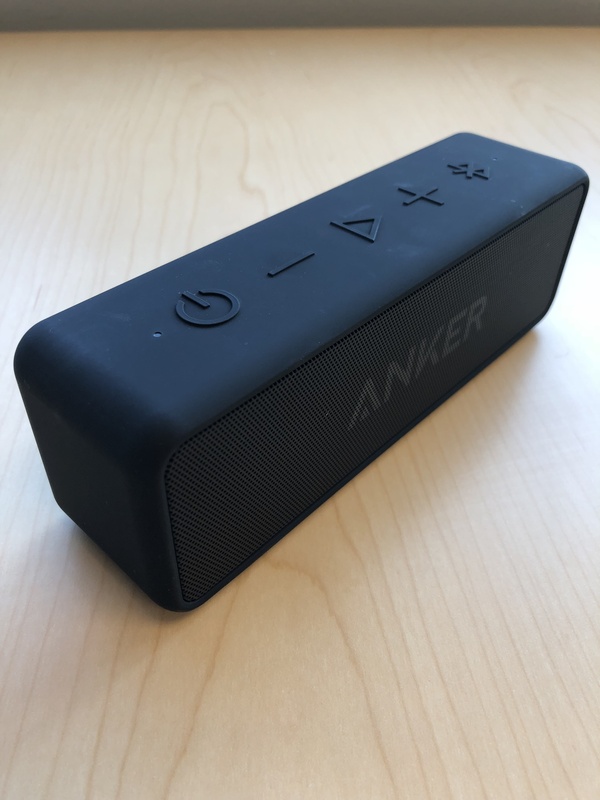 Anker rates this speaker at 24 hours and I'm pretty sure I've gone over that before. This is especially nice because if it's sitting on a shelf, you don't have to leave it plugged in, which makes everything look less cluttered. It's also great for taking to a bonfire, camping, tailgating, etc. Speaking of outdoor activities, the speaker is water-resistant, so you don't have to worry about it getting wet. I just went camping over the weekend and overnight, I forgot to put it away. Despite it getting rained on, it still worked like a champ the next morning. The sound quality is excellent. While I wouldn't say it's on the same level as the Soundlink II, but it's right up there. The bass is excellent, no distortion on max volume and the mids, highs, and lows are all good. I will say, I'm by no means an audiophile, so take that for what it's worth. The look of the speaker itself is okay. I wouldn't say it's a "premium" look that you'd want to have on your mantle, but for the price point, what can you expect?! I appreciate the "rubberized" button of the speaker, as it doesn't move around the counter/shelf (like my Jambox does). These are little things, but worth considering if you are thinking about purchasing the SoundCore 2. You can't link two speakers together for stereo (like you can with the SoundCore Motion B). The buttons on top of the speaker are black on black, so a little hard to discern in low lights. The on/off button is a press and hold button, instead of a one touch. With all of that being said, the small cons do not outweigh all the pros of this speaker. This is a great speaker to take on the go if you are looking for something that has good sound quality, is durable, and is easy to use. And backed by Anker's generous warranty. All of that for a VERY fair price, you can't go wrong. Questions? Feel free to leave them below and I'll do my best to answer. Thanks for taking the time to read! I have the SoundCore 2 and I love it! Recently I have upgraded to the SoundCore Mini 2. Great extensive review! Glad the battery is really good, because that is very important if you are at a party or hanging with friends and need the tunes. Thank you for sharing! Nice! What are your thoughts about SoundCore 2 versus SoundCore Mini 2? Pluses? Minuses? 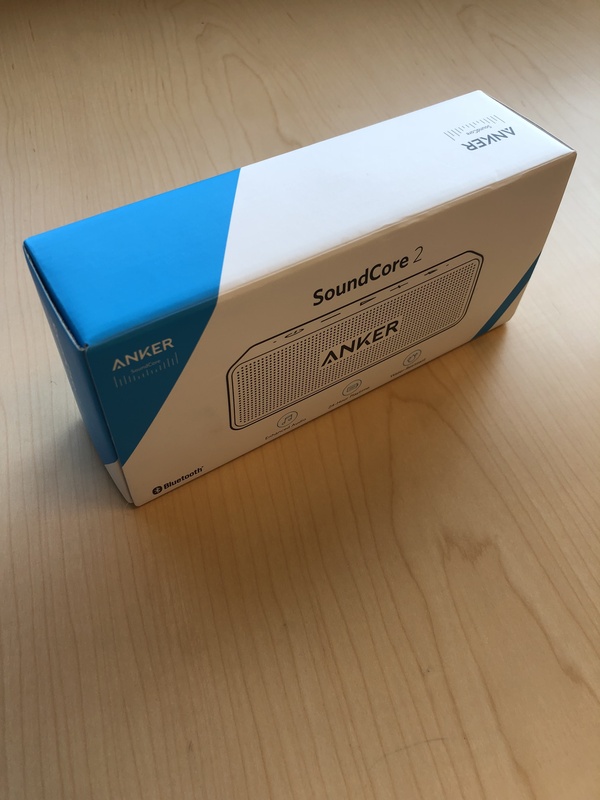 Wow, new package for the Soundcore 2! Love the frustration free packaging, you folks do a great job with that. While the Soundcore 2 packaging is nice, the Liberty packaging is off the charts! Received mines yesterday. Also coming from a Jambox myself, the Soundcore 2 is magnificent. I was totally shocked by the volume and sound. SoundCore 2 for the win! I sure that they both cost the same amount. The SoundCore 2 has more bass and louder where as the SoundCore Mini 2 is just as good but with less bass. I guess that the previous generation of the Soundcore Mini was far superior, because of the FM Radio and micro SD card playback. Does the sound start to distort when the speakers are at max volume?